There's 192 acres of skiable area, and all of it makes for good skiing. There are 4 different ski lifts here, and they will get you up the hill effectively. This ski area has an altitude difference of 1,072 feet; Kartepe makes great use of it. The 12 ski slopes at this ski area are great to ski on. This ski resort has a much lower than average percentage of challenging trails and a much higher than average fraction of blue and green runs. The Turkey peaks in the wintertime are always wonderful for skiing and snowboarding. region, you'll bump into loads of ski areas. 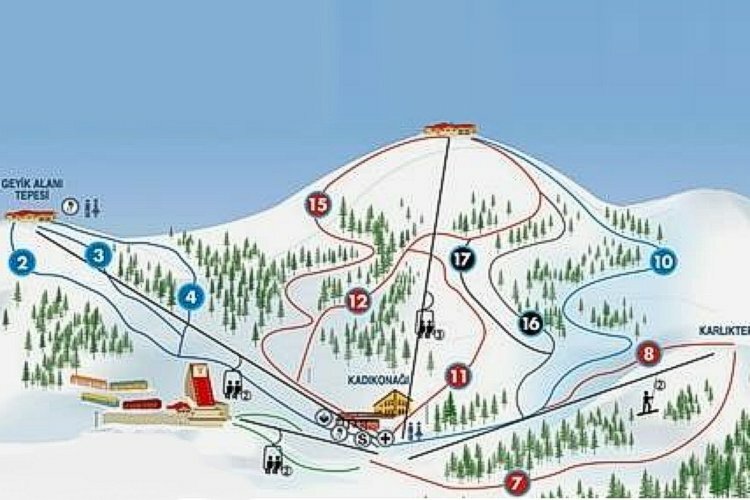 The trailmap of Kartepe on this internet page unsurprisingly says a thousand words. Kartepe is a family friendly ski area with loads of intermediate or beginner runs for learners. The grand mountain scenery of Turkey and fantastic slopes are fine attractions for loads of snow folks. Good exercise and just being on the ski slopes for a while have ski people coming here. Skiing and snowboarding here in Turkey is lots of fun through the snow season.